Yes, it's not something every woman likes to do, but you have to take your pap smear as a necessary evil that you cannot do without. A pap smear or also known as a pap test refers to a procedure that checks how many abnormal cells are there in your cervix. There may be a change in the cells of your uterus due to cancer, infections or other reproductive problems. In fact, it's the most popular screening test being used to diagnose cervical cancer. It is, therefore, important to go for a pap test annually, and you need to discuss it with your doctor if you're noticing any problems like spotting after Pap smear. Is Spotting After Pap Smear Normal? Spotting after Pap smear isn't that unusual because the procedure involves using a plastic spatula and a small plastic brush to remove cells from the surface of your cervix. The scraping sometimes leads to bleeding, but the procedure itself isn’t painful. Here are some possible reasons why you may notice spotting after Pap smear. As mentioned already, a cervical scratch may lead to bleeding after a pap test. The lining of the cervix is quite delicate, so it is common to notice some bleeding after the test. Since the bleeding is mostly spotting, it usually stops quickly. You may experience a surge of blood to your cervix after a Pap test, and this can cause bleeding or spotting in some cases. With excess blood flowing to your cervix, even a small scratch will lead to bleeding. Smooth, fingerlike growths called cervical polyps may well be the reason of bleeding after a Pap test. These small growths usually extend from your uterus and go to the cervix. These cervical polyps may start bleeding after a Pap test because of a chronic inflammation, infection, congested cervical vessels and increased levels of estrogen. Is Spotting After Pap Smear During Pregnancy Normal? Spotting after Pap smear is normal, even when you're pregnant. Most pregnant women take bleeding as a sign of a miscarriage, but that's not the case here. One of many causes of witnessing spotting after a Pap smear is that your reproductive organs become extremely sensitive during pregnancy, so even a small irritation can lead to bleeding. Increased blood flow to the cervical region during pregnancy is also a contributing factor. Due to the sensitivity of your reproductive organs, you may experience bleeding during pregnancy even if you have never experienced any bleeding during your regular Pap tests. You also need to understand that carrying out a Pap smear during pregnancy isn't harmful for you or for the growing fetus. You should always go for a Pap test during pregnancy to ensure you don't have any infections or sexually transmitted diseases. 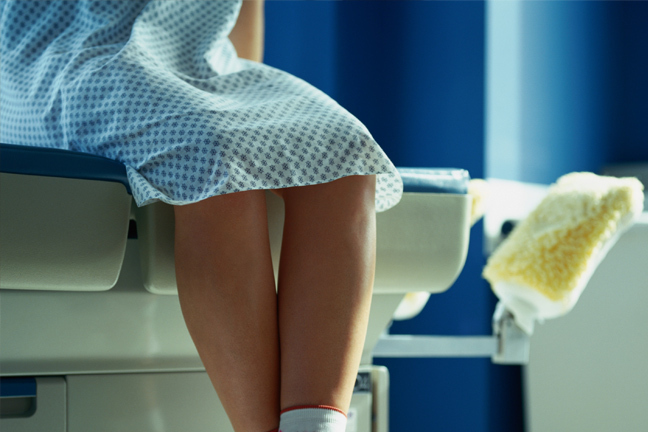 When Should You See a Doctor for Spotting After Pap Smear? Spotting or even a little bleeding after a Pap test isn't anything you need to be concerned about, but it makes sense to go see your doctor if you bleed heavily after your test. Excessive bleeding may well be a sign of an infection, and it may be due to an STD if you're pregnant. You need to bear in mind that a Pap smear may only cause spotting or light bleeding that should stop within a couple of days. If the bleeding continues or you notice specific symptoms such as dark or very bright red blood, severe cramps, or heavy bleeding that soaks more than one pad an hour, you should see your doctor immediately. You may consider placing a pad in your underwear if you experience bleeding after your Pap test. It is, therefore, a good idea to keep a pad in your bag when you go for a Pap test. It is also important to change your pad on an hourly basis to know if the bleeding is becoming heavier or it has stopped already. It is a good idea to avoid engaging in any sexual activity while you're spotting after a Pap smear. You will be better off using tampons for a few days even when the bleeding has stopped, because excessive pressure on the cervix may make you bleed again. You need to bear in mind that even though there is a slight risk of bleeding involved, you should still never overlook the importance of going for a Pap test. If you're not pregnant, be sure to go for a test every 1-3 years or sooner if possible. For pregnant women, it is important to go for a Pap smear test at the first parental work-up. You usually find the test quite painless, but spotting after Pap smear may cause some pelvic discomfort or pressure on your pelvis. It is also common to experience mild abdominal cramping after your test. The complications won't last long, and you may take OTC pain medications if abdominal cramping persists.